June 4 , by Mardi Robyn. I like the look of jewelry made from fabric. I have yet to try making any, but my stash of fabric is building up. 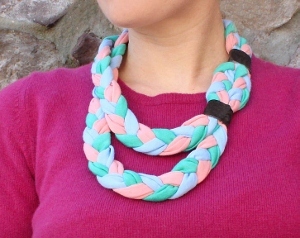 Check out this fun tutorial and learn how to turn your old t-shirts, or fabric collection into a wearable necklace! This DIY Braided Jersey Necklace with Suede Detail is a perfect project for teens to do during their summer vacation!